It's okay to admit it: the red city can get a bit crazy. Between the swarming taxis, packed streets and the never-ending bustle of the Medina, Marrakech is a lot to take in. 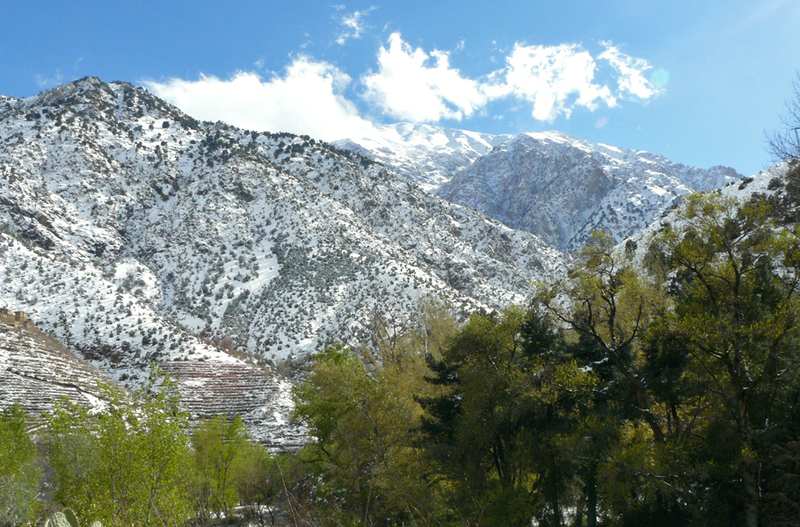 Fortunately, the Atlas Mountains offer a nearby escape. The towering peaks hover on the horizon, tempting travellers with snow-capped summits in winter. Their folds create majestic valleys and sharp cliffs, occupying a spectacular position between the city of Marrakech and the Sahara Desert. I've rounded up suggestions on what to do on your first trip to Marrakech before, but I think the expanses beyond city limits warrant their own post. If you should find yourself in Morocco with a free weekend or time for a day trip, they're definitely worth a visit. The Atlas Mountain range extends from Morocco, across Algeria and into Tunisia, with the tallest peak located just outside Marrakech. The range is not only a striking contrast to the clay and cobblestone city, but is also home to small villages, farmers and locals living a more nomadic life. While many travellers hire a car and set out to explore the Mountains' crevices, I would recommend considering a tour offered by a guide who knows the roads and how the weather changes, as some of these spots can be difficult to reach after snow or rain. Travelling at night is also not a good idea, given the narrow passes and lack of street lights, so make sure you leave enough time to get back to the city before dark. Depending on your interests and the length of your stay, there are multiple tours on offer and spots to see. If you're in town for a few days, you can combine a visit to the Atlas Mountains with a desert trip, or even stay overnight and camp out in traditional tents. Nearby towns like the fishing village of Essaouira are also popular, if you're craving some sea views and calmer streets. 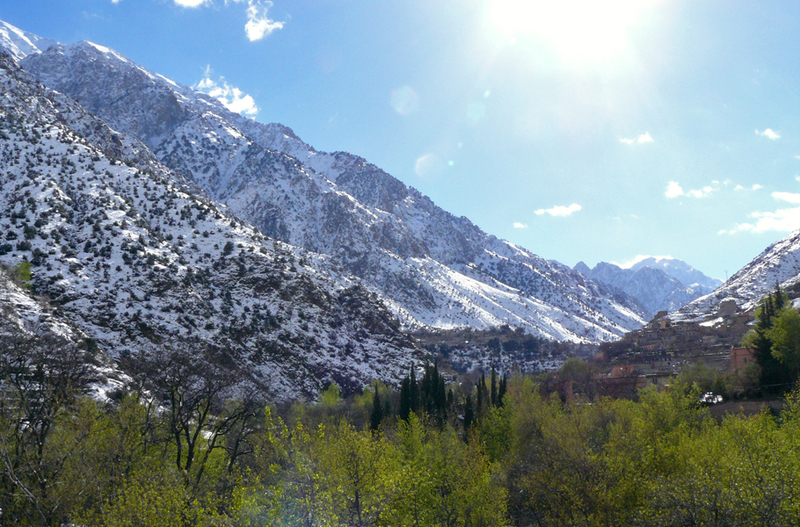 Head out of Marrakech, take a winding mountain trail and you're there: the Ourika Valley. The road is dotted with photo stops, offering great views as you drive alongside a river and look up the steep slopes on either side. The Valley caters to visitors with local ceramic and souvenir stores, boutique hotels and cafés serving traditional Moroccan dishes. You'll see rows of tagine pots lined up outside the restaurants, with whole tomatoes resting on the top of the pointed pot to confirm that it's still full of food. Depending on your particular interests, you can take a hike in the valley to waterfalls near the village of Setti Fatma, or visit a Berber house set up to show how Morocco's traditional inhabitants farmed the land. They'll explain how they ground flour using the water from the river, walk you around a typical dwelling, and make mint tea for you to try. They'll also tell you stories of the snows, droughts and floods -- low lying areas in the Valley, although closer to water supplies, are also most badly hit when the weather turns. The Valley is also home to an Argan oil (also called Moroccan oil) cooperative, which sells everything from Argan oil hand cream to edible nut butter and cures for every facial ailment. The shop also comprises a work room where local women sit and make the oil, crushing the fruit in hard stone mills to capture the precious oil. A warning to budget travellers: while Morocco has a bartering culture and you can usually negotiate what you want to pay for everything from tea pots to carpets, many of the stores in the Valley can have quite high prices (some of them are fixed). Investigating the cost of items in town (for example, Argan oil cosmetics in the supermarket or local pharmacy) can ensure you don't spend next week's grocery allowance on a plate you'll see in the souk tomorrow for half the price. Ever wanted to spend an afternoon pretending to be in Game of Thrones or an Indiana Jones movie? You can do both at Aït Ben Haddou. This ancient walled city is about a four hour drive from Marrakech, perched on a hill on the fringes of the Sahara Desert. Its original structures date back to the 17th Century, and it's featured as a backdrop for a number of Hollywood movies and TV series over the years. While most residents have relocated to the more modern neighbouring town, a few families still live inside the city. 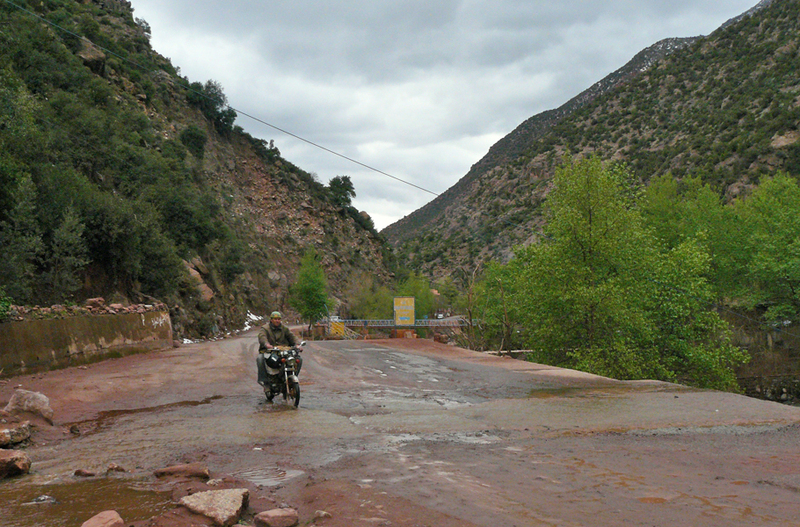 To get there, you have to head up and over the Atlas Mountains, which is an experience in itself. The route involves navigating the Tizi N'Tichka mountain pass, which offers magnificent views but is also likely to leave you clutching the seat and trying not to look down. At 2260 metres above sea level, it's one of the highest mountain passes in North Africa, with every twist and turn offering stunning scenes and post-card worthy shots. Once you reach Aït Ben Haddou, you can explore the UNESCO World Heritage Site independently or with a guide. While it is an additional expense, a guide can give you a little bit more background into what you're seeing, since signs en route are limited. For example, our guide told us about how the city used to be a stopping point for visitors headed in from the Sahara, just a few hours away. He explained how the homes were built using clay and natural materials, which is what is still used today when a building needs to be repaired. He also took us to local artists and a school which teaches young women how to weave traditional Moroccan carpets. The Berber paintings are an interesting activity to watch - they're made with inks derived from local plants and spices, which darken when exposed to flame. When the back of the paper is burnt, the colours deepen and give off a caramel smell as the sugar melts. An explanation from the head of the handcrafts school also gave me more of an understanding of what I was actually seeing in the brightly coloured carpets available all over the souk. He spoke at length about the materials used (from cactus silk to camel hair to saffron for the dyes) and the different symbols, which all have meanings in Berber culture. Because of this, every carpet is different, as it's composed of different shapes and figures which were important to the woman who weaved them together. 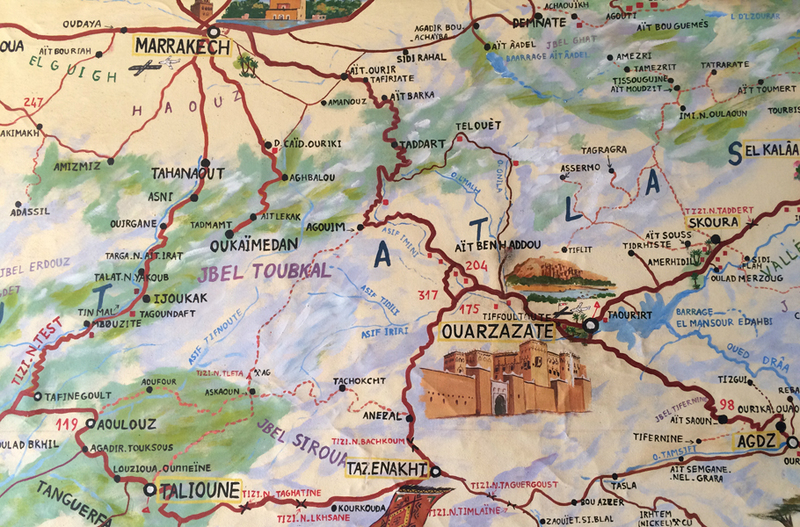 Known as both the door to the desert and the 'Hollywood of Morocco', Ouarzazate is a popular stopping point (and usually bundled in with tours to Ait Ben Haddou, given its proximity). 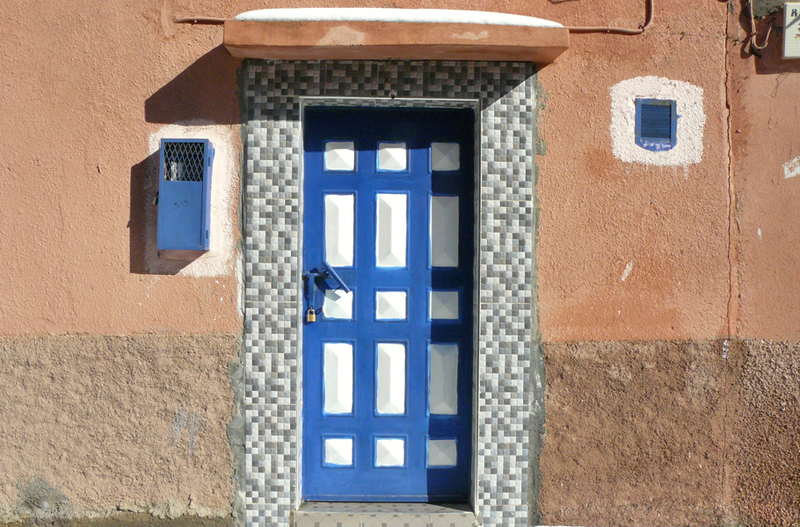 The town is home to various film studios and a Cinema Museum, as well as markets and the Taourirt Kasbah. The Cinema Museum is an interesting find, although not what I was expecting. We opted to go without a guide, but this was probably not the best way to experience it as there aren't many signs inside to explain what you're seeing. The Museum is home to life-size representations of movie sets, which look to be built out of wood or marble but are actually made of fibre glass or paper maché. While I'd never heard of some of the films (beyond Kingdom of Heaven, Prince of Persia and Lawrence of Arabia), it was still fun to explore dungeons, throne rooms and magnificent courtyards and pose for photos in shackles or between pillars that looked like they belonged at Hogwarts. Have you been to Morocco? What desert and mountain escapes do you recommend? Let me know in the comments.